To begin, I apologize for my extended absence! I blame loads of school work+work+severe allergies making me not feel so hot. Ack. BUT! 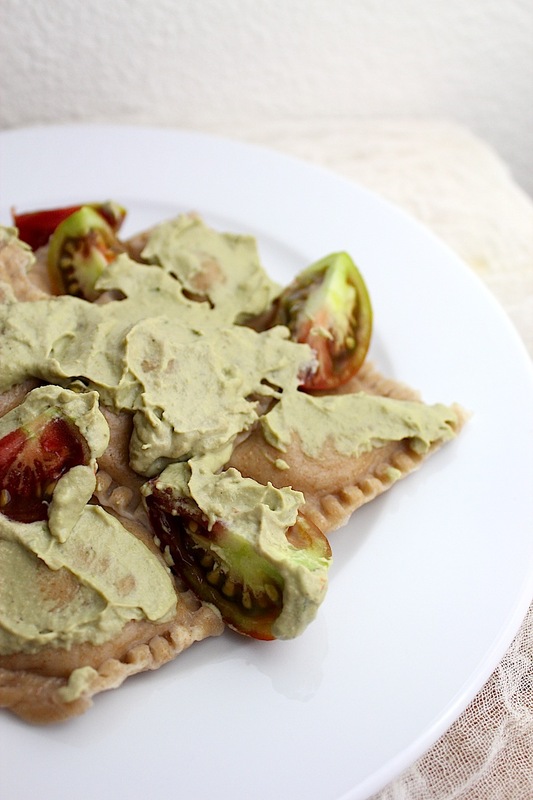 I was inspired this morning by a glorious post over at Love Veggies & Yoga! I glanced at the post this morning before class, couldn’t stop thinking about it throughout class and immediately upon getting home, I whipped out the VitaMix and went to work. The can of pumpkin puree was calling my name and the weather outside made this perfect! It’s been overcast and chilly, which I love! Fall is here. Leaves will start turning soon, though here in Denver, they aren’t as plentiful as in Michigan. I will soon be seeking out a cider mill/apple orchard to quench my ravenous desire for fresh donuts! and hot cider! I LOVE FALL. Back to the matter at hand. 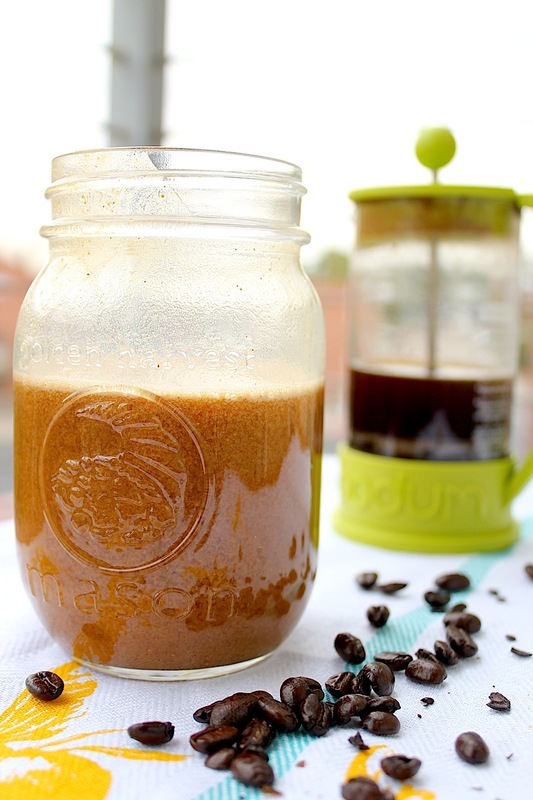 Love Veggies & Yoga‘s beautiful post on making your own pumpkin spice latte ran dear and near to my heart. All too often I give in to $tarbucks and indulge in their overly pricey and overly sweetened lattes. NOT TODAY! I pretty much followed her recipe verbatim, except I didn’t have pumpkin pie spice. So I threw in some ground ginger, cinnamon, cloves, nutmeg and hoped for the best. Almond milk worked great with this! SO GOOD. Thick and spicy. I loved the froth that just appeared when I mixed the pumpkin milk with the coffee. As always, I highly recommend making your coffee from a french press! So much more flavor and with all the essential oils found in freshly ground coffee beans. 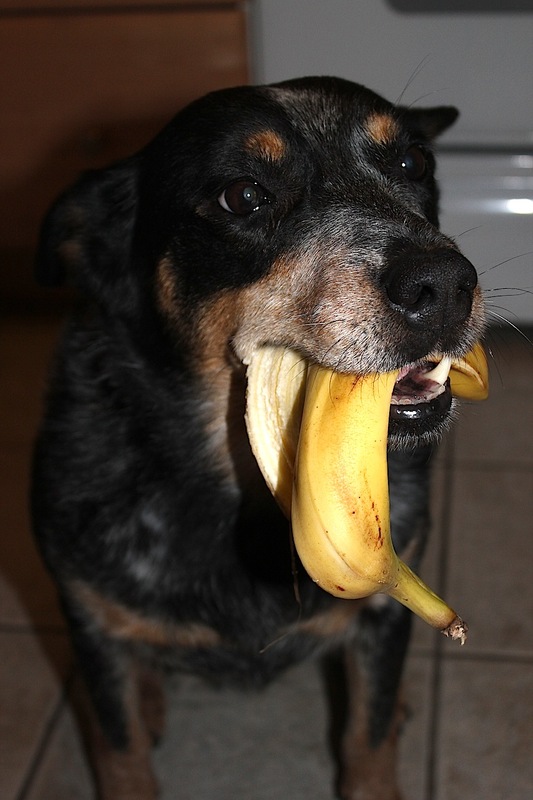 Nom nom nom. Many thanks and praise to Love Veggies & Yoga! It literally made my morning. 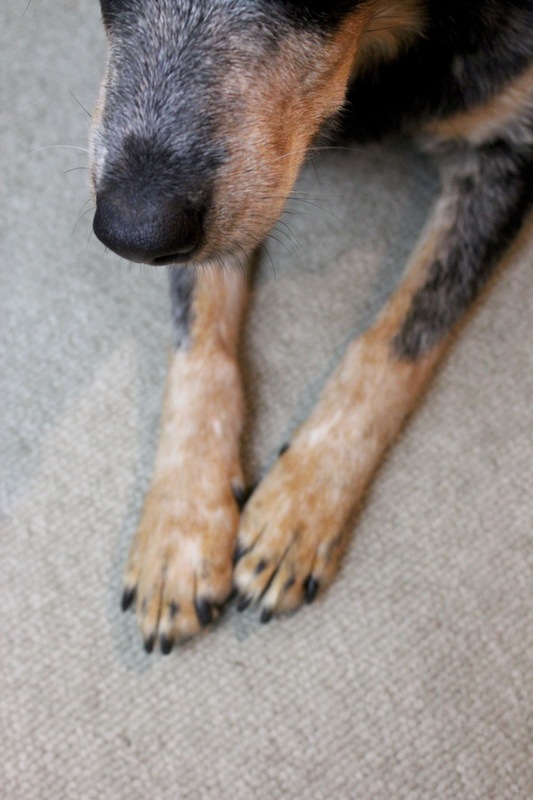 I will make a valiant effort to contributing more to this blog! I feel so disconnected from the blogging world. I haven’t even been keeping up with my favorite food blogs! For shame. Oh, and is anyone else on Pinterest? It’s really addictive. Methinks it might help me actually get some wedding planning done…but who knows. So many neat ideas out there! 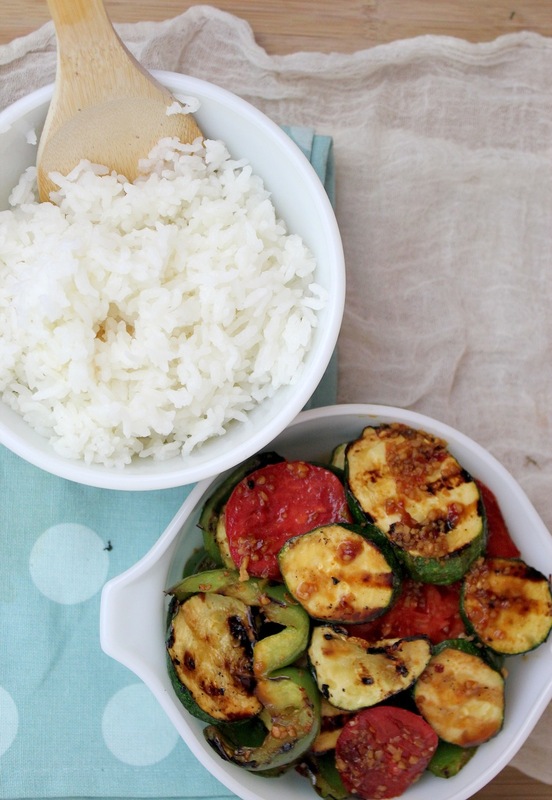 Quick & Easy Weeknight Dinner – Grilled Vegetables & Rice! 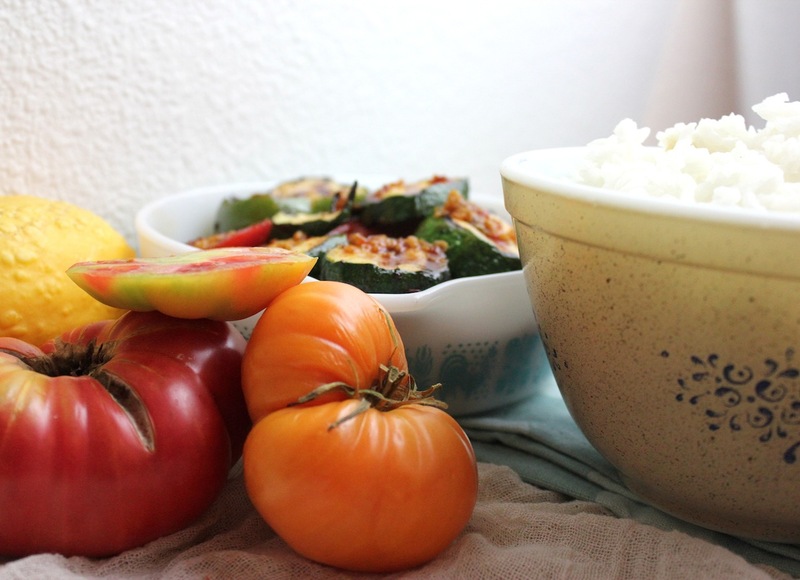 Two staples that will pretty much always be found in my kitchen: vegetables and rice. Since we haven’t ventured to the grocery store in far too long, dinner had to be whatever we had on hand! After a rather laborious dinner the other night, I was in no mood for drawn-out dinner shenanigans, so N got some rice cooking while I was on my way home. I whisked together a quick+simple marinade for the vegetables (soy sauce, ginger, sesame seed oil, LOTS of garlic, agave nectar, & chili paste), sliced some zucchini and green bell pepper and let sit for a few minutes while the grill was heating. The awesome thing about vegetarian marinades? They can also be used as sauce after everything is cooked without worrying about contamination from raw meats! Nom nom nom. While the vegetables were grilling and the marinade was looking a little lonely, I sliced up some beefsteak tomatoes and let those soak up the lovely sauce for a bit. No need to grill the tomatoes, these tasted great raw! Once done, everything gets thrown in a bowl to commence devouring. Turn this all into a wrap! Add some beans & cheese and you got yerself a burrito. Today felt like a Monday. It just had the miserable undertones of the start of a week. I blame this on my staunch efforts at being on class on time at 8am…and after sitting on a crowded, hot light rail, I walk to the classroom and see the “class canceled” sign. GRRRRRRR. Ah well. I’m quite fortunate to have a loving spouse (N) who is so supportive of my strange fascination with photographing food and gladly assists me with my cooking when he can! While I was at work, perusing foodgawker and answering the occasional reference question, I remembered we had a butternut squash sitting on the counter. N cut it up and threw it in the oven to roast while on my way home. I’ve been wanting to try making ravioli since I got the pasta roller and finally, I succeeded! Mix all dry ingredients together. Slowly work the liquids in until dough begins pulling away from sides of bowl (you may have to add more water–I added a few tbsps more). Dough should be firm, just barely tacky and not overly sticky or soft. Divide into even amounts (I just grabbed two globs at a time and made them feel even in my hands). Roll through a pasta roller, but do not roll too thin, otherwise the ravioli won’t be able to handle your filling and might fall apart. And that would be devastating! Set the sheets on a well-floured surface. Spoon your desired filling by the teaspoonful onto a sheet. I was able to spoon about 6 blobs onto each pasta sheet. Take the second pasta sheet and gently lay on top of the blob-filled pasta sheet. GENTLY press the top sheet down around the blobs and seal. I didn’t use any water, but I hear this is a good way to make a solid seal. 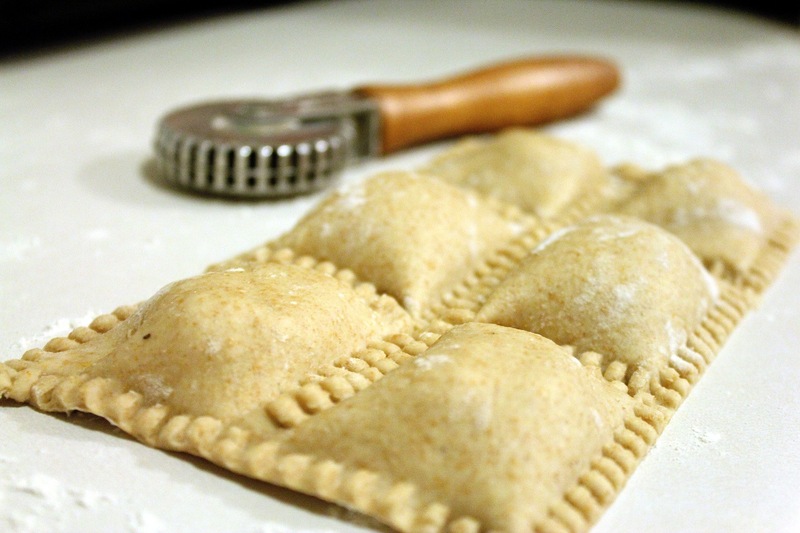 I have a handy pasta cutting tool that made the fun crinkles around the edges of the ravioli, but it isn’t necessary. Use a sharp knife to cut the ravioli and if you’re feeling fancy, use fork tines to make pretty edges. Let the ravioli sit for a few minutes and bring a pot of salted water to boil. The pasta only needs a couple of minutes to cook, so make sure your sauce is ready! Now, the filling. My filling was not a huge hit. I wasn’t a fan. I think my butternut squash was a bit old and just tasted…funky. 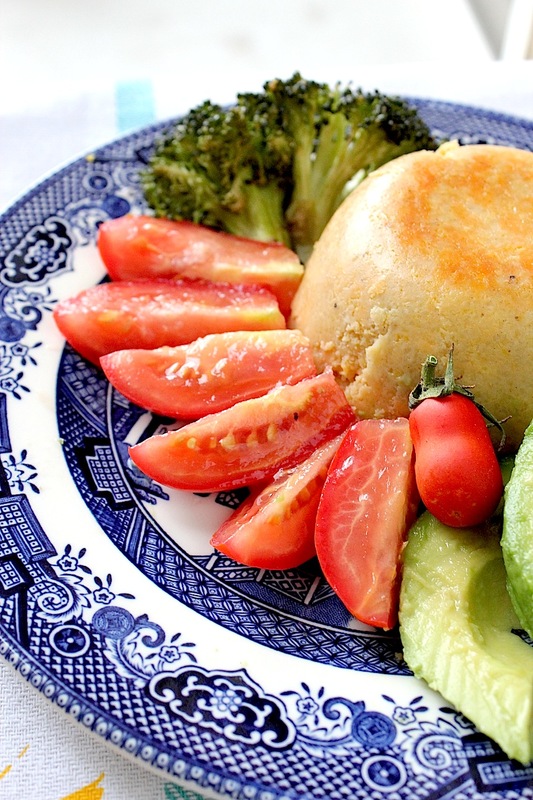 Everything else in this dish was great…except for the filling. So sad! But, live and learn. I will improve next time! So, the only advice I have for you: be creative! 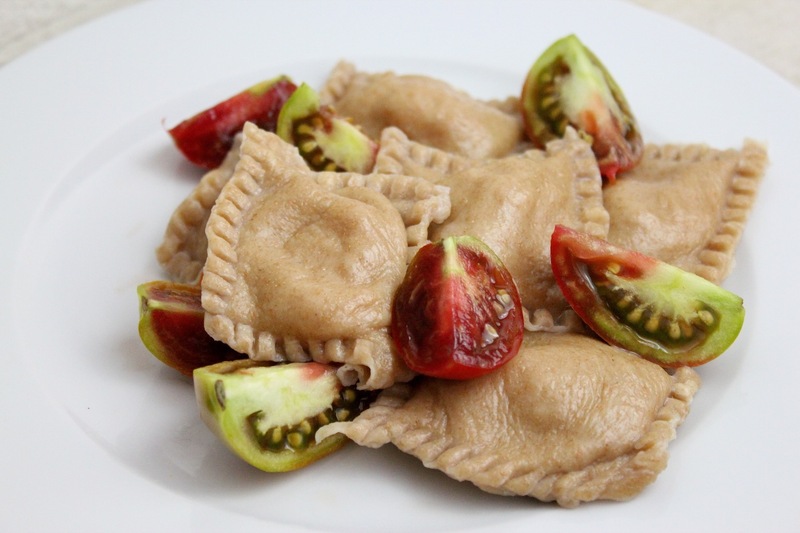 Fill the ravioli with whatever your heart desires! Be indulgent and controversial! Savory & sweet! Yum. Heat the oil in a saucepan and saute the minced garlic. Toss in the basil, stir and wilt. In a blender, throw in the raw cashews, add salt+pepper and the ingredients that were in the saucepan. Blend on high, slowly adding milk until you get the desired consistency for the sauce. Pour everything back into the saucepan and heat. DONE! Easy. You can do this. It turns out to be a lovely puke green color that I enjoy incorporating into as many food dishes as possible. 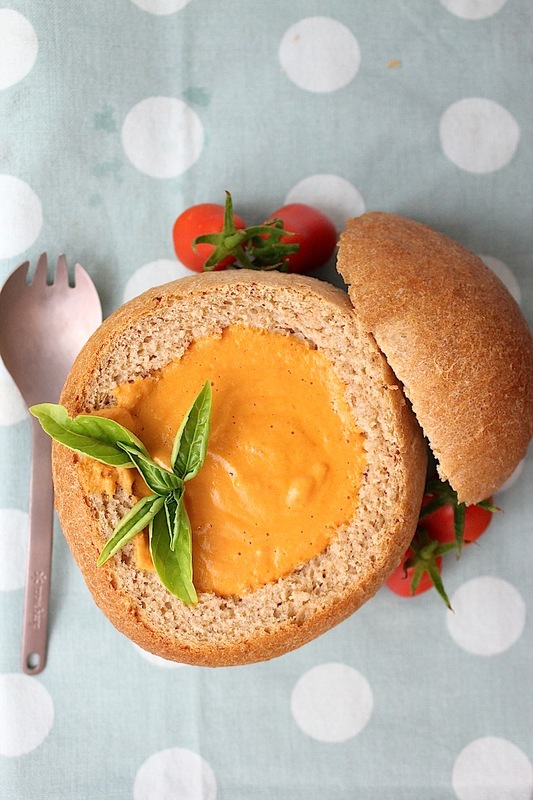 Creamy Tomato Soup in a Homemade Bread Bowl! I am definitely a Fall and Winter person. I love feeling all snuggly in a hoodie and throwing on lots of cozy layers. 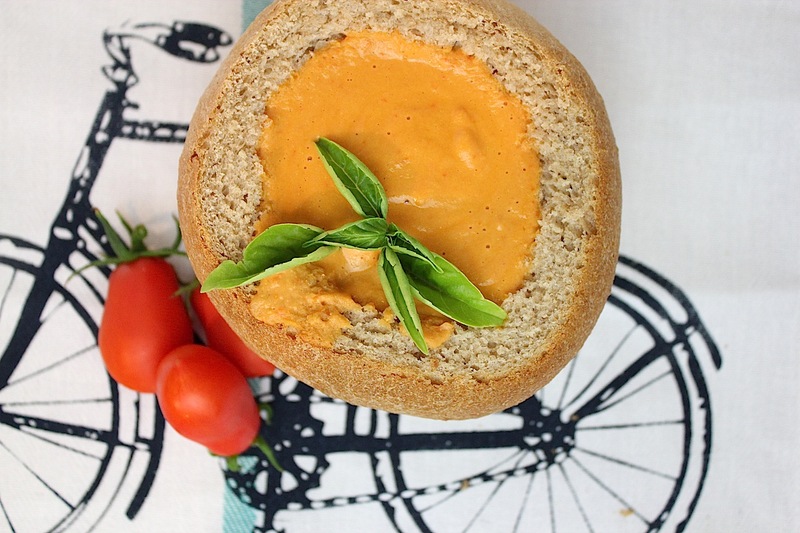 So even though it hit 95 here in Denver today, I couldn’t get my mind off of making some soup in a bread bowl! My garden has been overflowing with ripe Roma tomatoes, so a creamy tomato soup just seemed right. For the bread bowl, I just used this recipe from my previous French Bread post, except this time around I used 1/2 whole wheat flour and 1/2 all-purpose. Still quite nice and fluffy. I let the dough rise twice–once right after it was mixed and then after I shaped them into boules. I recommend re-shaping them once again after they have risen because they tend to widen a bit as they rise. You want all the seams in the dough to be on the bottom (kind of like when you turn the ugly side of the Christmas tree toward the wall where no one will see it). The tomato soup is a staple for me, especially when I’m looking for something quick that I can whip together in a few minutes. For a super fast and painless meal, use canned, diced tomatoes (though, of course, the flavor isn’t the same!) I soaked about 1/2 cup of raw cashews in water for about an hour to make the cream for the soup. In a large stock pot, I sauteed some olive oil, lots of minced garlic and chopped onion for a few minutes until the onion became translucent. I added chopped, fresh roma and beefsteak tomatoes and let simmer until the flavors mix and everything starts getting soupy. This soup has to be really thick otherwise when you pour it into the bread bowl, it will immediately just soak in and everything will get mushy. No good. To thicken the soup up, I added some cashew cream that was quickly made by processing the soaked raw cashews with a bit of water until you get a thick consistency. Since I like my soups thick and creamy, I threw everything back into the blender and whirred it all up until very smooth. I may have added a bit too much cashew cream, hence the reason why my soup is more orange than red! Still very savory. Fresh basil paired well with this. When you make this, be sure to bring your appetite! Or just make your boules smaller 🙂 Since my beloved is spending the week in Michigan, I have an abundance of food and no one to eat it. I might try freezing the leftover boule and then thawing/re-heating when I’m ready to use it as a bread bowl again. We shall see how that goes. My tastebuds no longer find polenta shrouded in mystery. I’ve seen polenta in so many vegetarian recipes, but have had yet to try it and experiment with it. At its most basic, polenta is just corn grits that is boiled until a thick paste and can pretty much take the form of whatever dish you’re thinking of (sweet or savory!) I just picked up a bag of Bob’s Red Mill corn grits, googled for some general advice/ideas on what to do with polenta and pretty much just made it to see if I would even like it. This really isn’t a recipe or specific dish per se because I just wanted to use up some veggies I had sitting around. And the avocado was staring deep into my soul, beckoning me to devour it. So it goes. I am loving all the roma tomatoes I keep picking from our garden! They are small, sweet and beefy and I seem to be eating them with every meal. Yay lycopene! Overall, I really enjoyed the polenta! It was creamy and I can see it having much potential to develop into any sort of dish. I baked my polenta because I wasn’t too in the mood for mush! This went well with some roasted veggies on the side. Bring liquids to a boil in a large pot. Slowly whisk in corn grits and simmer for 5-10 minutes, or until thick, being sure to avoid lumps. Remove from heat and stir in cheese. The polenta can be eaten this way or fried in a pan for a few minutes, spread into a thin layer on a greased baking sheet and cooked for about 10-15 minutes, flipping once during that time. 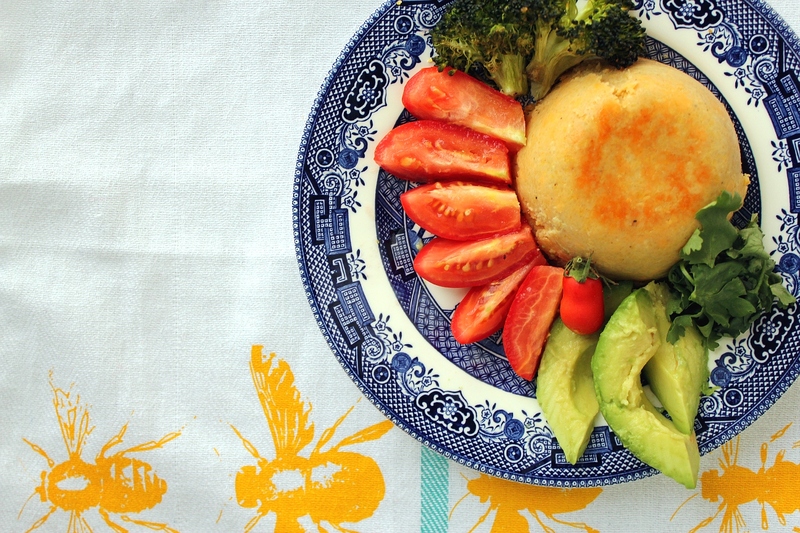 There are also many other ways to prepare polenta! Just do some googling and experimenting. Leftover polenta is awesome. I think I will be slicing some of mine up and grilling it! Yum. First week of fall semester has been conquered! Just 14 more…eeek! I really think I’m going to enjoy my “Religious Movements of the US” class. I am constantly fascinated by the objective study of religions, their ideologies and effects on society and truly get sucked in by learning about cultural taboos, similarities between all religions and their historical background, whether rooted in fact or fiction. This can be a touchy subject for many people, but I love this sort of controversy and seeing what it stems from. Thank you, anthropology! 🙂 My professor for the course is definitely a button-pusher–from the moment she made her grand entrance into the classroom, she’s been dropping f-bombs, pushing boundaries and forcing us to think about our own beliefs. I really feel I learn the most from eccentric, critical professors that force your to think outside the box. Classes such as this one make me feel like the amount of money I’m putting toward my education is worth it. 🙂 But now, it’s late and I have to get up early! Goodnight moon! Weekend Recap! Palisade & the Warrior Dash! Whoa, it’s Tuesday (Wednesday? I started this yesterday…) already? The past few days have been quite the whirlwind and I still don’t feel caught up! I blame Fall semester starting and the high pollen count in the air! Can’t. stop. sneezing. Time for more coffee! 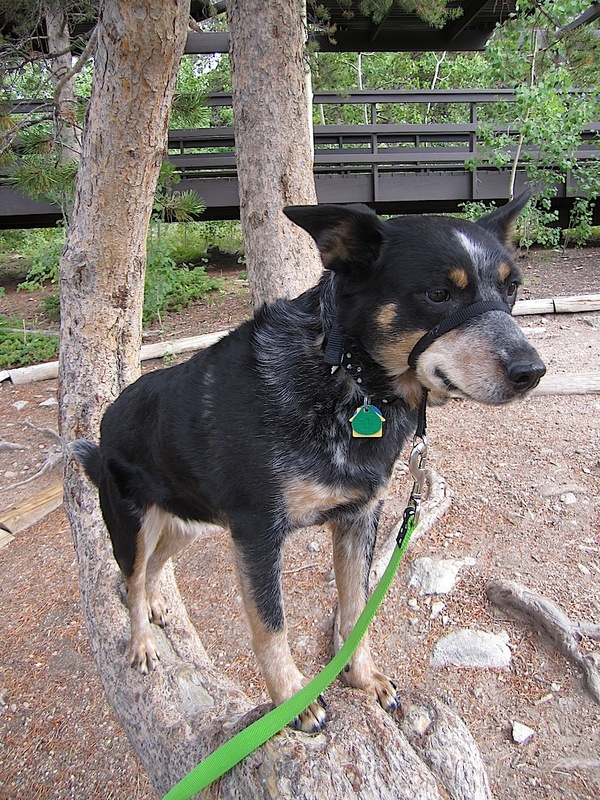 We stayed in Glenwood Springs this weekend, but didn’t go to any hot springs! It was just too hot. Didn’t feel right getting into a 106 degree pool of water when the air temperature was still 85. eeesh. On Saturday we moseyed an hour west to the beautiful town (city?) 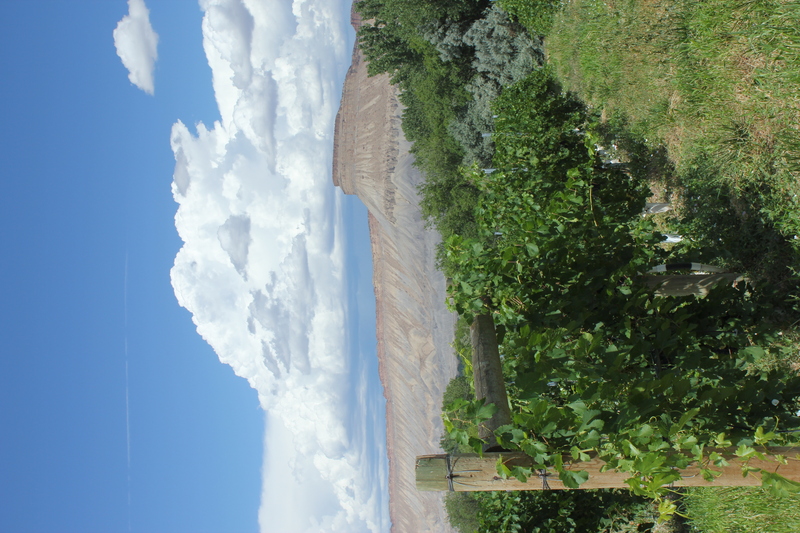 of Palisade, Colorado for the Peach Festival and some wine tasting. It’s a strange landscape in Palisade because you see all these large mesas and a desert-like terrain and then there’s all these lush orchards in vineyards. Makes for some great pictures! The Peach Festival was…interesting. Not as peach-themed as I had hoped! It just seemed like a typical art fair thing with booths set up for Verizon and a couple other local retailers. Kind of strange seeing cell phones being sold next to peaches… Though, we did have a really great peach daquiri and I devoured a veggie gyro that had DOLMADES in it! Gah, I love dolmades. Can’t say I’m brave enough to attempt making them, but maybe someday. It was a super hot day and we were quickly baking in the sun, so after I had a chance to pet an alpaca, we bought a couple boxes of peaches and headed out to some vineyards! 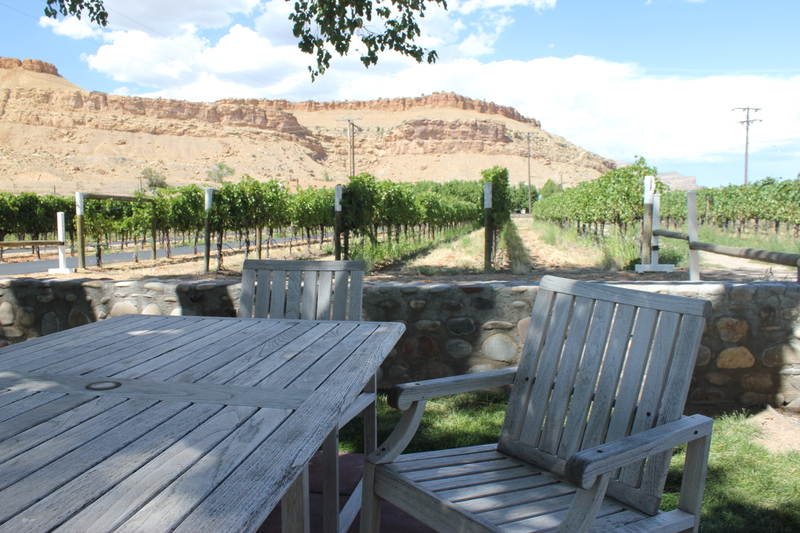 We visited Carlson Vineyards and Canyon Wind Cellars, sipping quite a few varieties of wine while taking in the views. The pourers at Carlson Vineyards were super nice, chatty and informative on the wines and grapes they were cultivating and kept pouring the wine! I could have tried more, but 6 tastes was plenty. 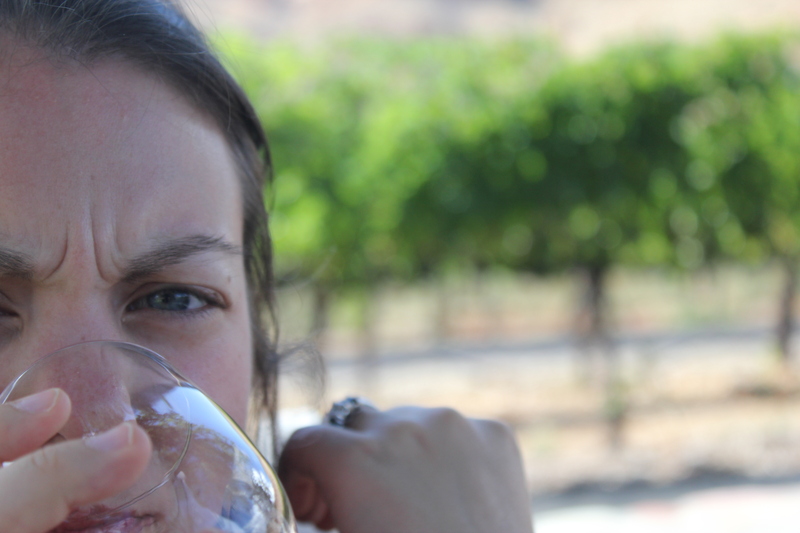 They had some really interesting ways to spice up their wines and use them in non-traditional ways. We tried a “peach cobbler” that was their peach wine warmed up and mixed with spices and some syrup. So delicious! i didn’t like the port. 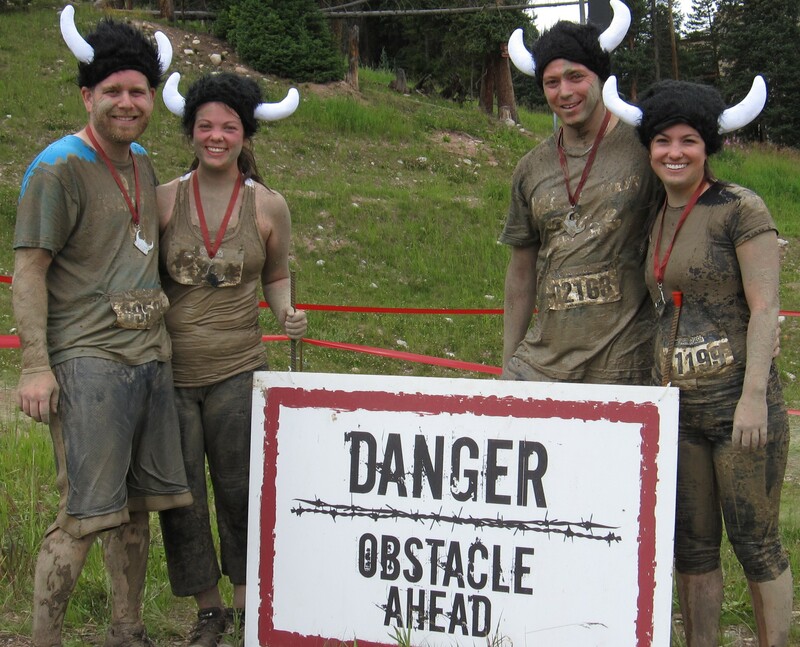 Sunday brought us cooler weather and the WARRIOR DASH at Copper Mountain! Being at Copper made me want to put my skis on. Who cares if there’s no snow? I was thankful that being at high elevation (9712 ft) the weather was much cooler, but then again, being at that elevation didn’t make this 5k any easier. It seemed like I couldn’t catch my breath the entire time! Totally worth it. So challenging and something I have never done before. Check out Warrior Dash’s website to see the obstacles we did. I jumped over fire! And crawled under barbed wire through mud! And conquered a wall! If you’re interested in doing a Warrior Dash, they hold them all over the US, in Canada and Australia! I would recommend anyone with an adventurous spirit to try it, even if it seems intimidating or “too hard”. You can do it! 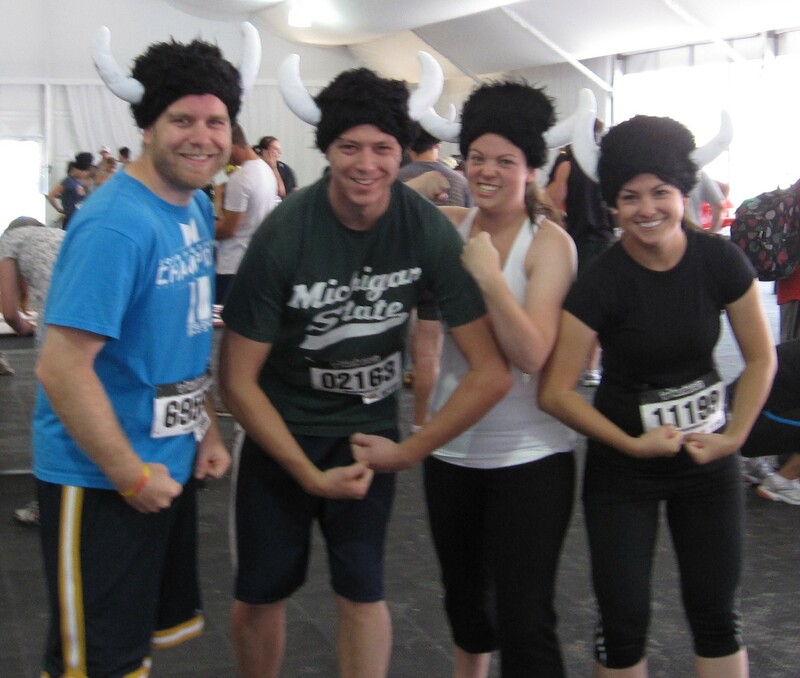 We didn’t even run for most of it because the obstacles were hard enough. I’ll definitely train hard for next year and think of a great costume. The only things getting me through the day today were coffee and the thought that I will be heading to Palisade, Colorado this weekend and then running the Warrior Dash on Sunday! 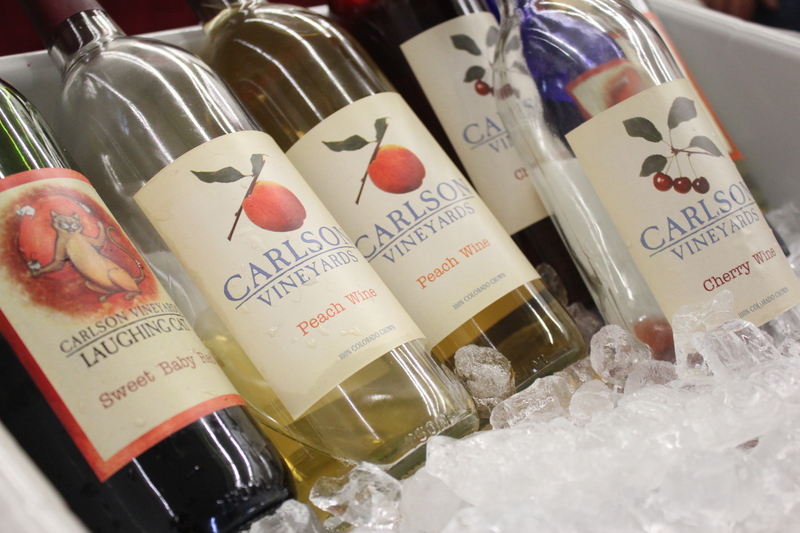 Super excited for Palisade because this weekend is the Palisade Peach festival and Palisade is known for their orchards and vineyards. Looking forward to sipping on some wine and unwinding a bit. Even though I was thoroughly tired after getting home from work, I was in the mood to make something that would be satisfying and make me feel accomplished! I’ve made gnocchi quite a few times in the past, sometimes without much success. Not the easiest dish to make, but I can’t get enough of those fluffy clouds of goodness. 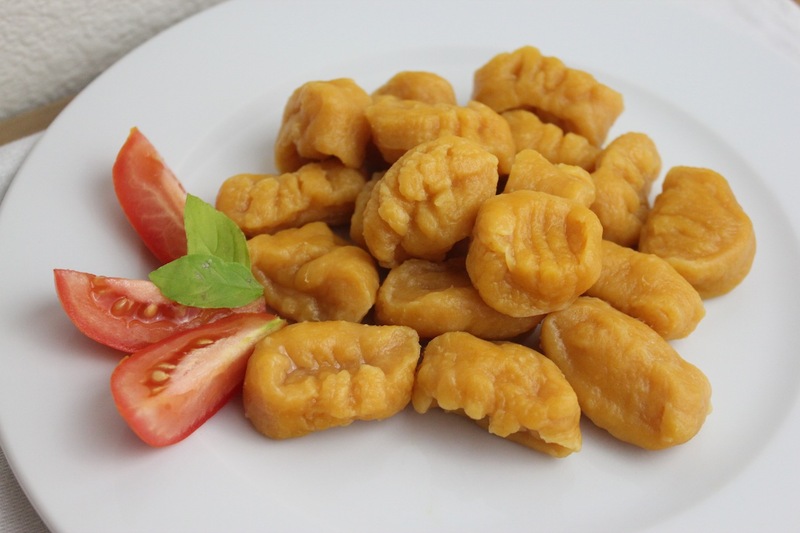 Making gnocchi really makes me want to buy a potato ricer…definitely a good thing to have. My gnocchi have always been made with the very basic of ingredients: potatoes, salt, flour and a bit of oil. Tonight? Butternut squash was on the menu. I love the color! There was also a hint of sweetness in the gnocchi, so it could definitely go well with a variety of sauces. Drain the cashews. Place everything in a high-quality blender and blend to desired consistency. Mine was super thick, should have added more water. Use vegetable stock for extra flavor instead of water. Warm up in a saucepan and add whatever flavors you like! Another approach to this would be to make a roux, bechamel or mornay sauce to go with this dish. 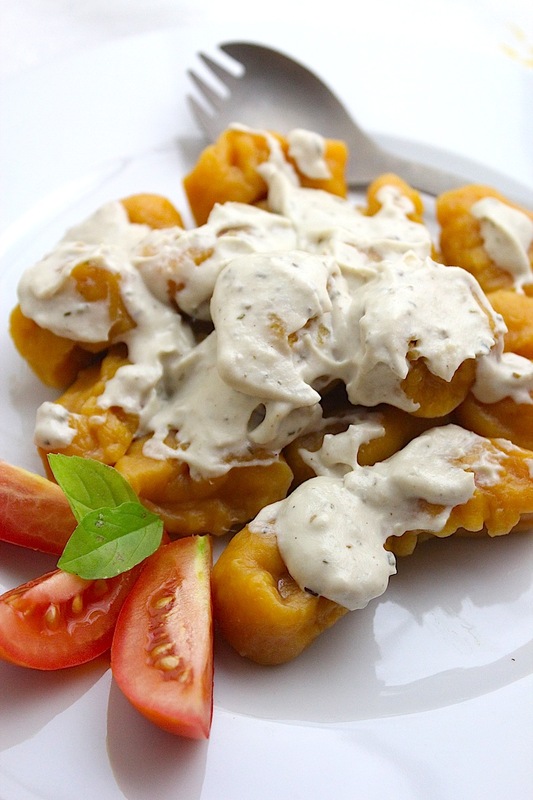 Simple white sauces are amazingly versatile! Bake butternut squash at 375 degrees until soft (this takes awhile, about 40 minutes). Scoop soft squash and spices into a blender and and blend until thick and pasty. Place the squash paste into a large bowl and begin working flour into it. I don’t have an exact measurement, since I just kept adding flour until it had the correct consistency. You want the dough to be soft and smooth, not dry nor sticky. Let dough rest for a few minutes. Bring a large pot of salted water to boil. Take a small hunk of the dough and roll it into a thin, round tube. Cut into 1/2″ long bits. Using a fork, smoosh the gnocchi into fun shapes. Experiment! Who cares if it’s authentic or traditional! Make bunny heads or stars! 😉 Make the gnocchi in small batches. Place in boiling water and when they float to the top, they are done! Fish them out with a slotted spoon and set aside. Top with tasty sauce of your choice! I made my gnocchi quite large and beefy, so they were more chewy than fluffy. Still filling and delicious! I served this with fresh heirloom roma tomatoes that I picked from the garden today. It’s true–vegetables/fruits that you grow yourself taste so much better. 24. recovering omnivore. works in a library. likes to answer your questions. plays with food. intrigued by anthropology. wonders why so many children come to the library with no pants on.